Daggett is an unincorporated community located in San Bernardino County, California in the United States. The town is located on Interstate 40 ten miles (16 km) east of Barstow. The town has a population of about 200. The ZIP code is 92327 and the community is inside area code 760. The town was founded in the 1880s just after the discovery of silver in the mines near Calico to the north. In 1882, the Southern Pacific Railroad with the Atlantic & Pacific Railroad (Later Atchison, Topeka & Santa Fe Railroad, BNSF) from Mojave was being completed in the area and it was thought that a good name for the town would be Calico Junction. But this name would be too confusing since it was right next to Calico, where the silver was uncovered. 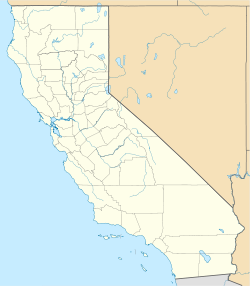 It was decided to name the city after then Lieutenant Governor of California, John Daggett, during the Spring of 1883. There were plans to make Daggett the main station of the area and to have a railyard there to handle the heavy trains coming from the East, but due to the silver mining making the prices of land go too high, the ATSF moved up to Barstow, California and established the main rail station there. In 1903, the San Pedro, Los Angeles & Salt Lake Railroad (later Union Pacific Railroad) also built their line from Las Vegas through Daggett to reach Los Angeles, California and East San Pedro by borrowing trackage of the ATSF through to Barstow to allow the servicing of their engines at the roundhouse located there. Borax was also important to Daggett's economy and the town's history. For two years, it was the terminal of the twenty-mule team run from Death Valley, but after one of their swampers William Pitt was lynched, the Pacific Borax Company made the terminal in Mojave. And later on in 1891, Francis Marion Smith the 'Borax King' moved down to Daggett from Death Valley's Harmony Borax Works to install mining operations at a borax came called Borate, which was located about three miles east of Calico. This operation required many laborers to come and help, it was reported that Pacific Coast Borax Company employed nearly 200 men to work in the mines. At first, the borax was hauled by the then-soon-to-be-famous 20 Mule Team, but Smith sought to replace the mules with more cheaper, efficient means of transportation. The Borate and Daggett Railroad was built in 1898 to take over the duty of hauling boraxfrom the mules. Daggett became quite a big city in the 1890s, boasting to have three stores, two restaurants, three saloons, three hotels, a lumberyard, and even a Chinese eating place. But after 1911 when richer borax deposits were discovered north of Daggett in Death Valley at the Lila C. Mines, all the mining operations were moved up there which caused Daggett to go into a steady decline which continues even to this day. But after the establishment of the solar energy plants, Daggett still struggles to hang on to life and there are still some people which travel through the town to reach Yermo, California and Las Vegas today. Daggett is the location of Barstow-Daggett Airport. The facility is a general aviation airport serving the Barstow area. It is also the regional weather information center. The airport was built as a modification center for the Douglas A-20 Havoc bomber aircraft that were sent to Russia as part of the Lend-Lease program during World War II. Daggett is part of the Silver Valley Unified School District. The Silver Valley High School is located at 35484 Daggett/Yermo Rd, Daggett, CA 92327, (760) 254-2963. As of 2003, 1000 people lived in Daggett, though nearly 1500 live in the surrounding area. Only about 200 people actually live in the town. [citation needed] The town's elevation is approximately 2,000 feet (610 m). The world's first commercial solar power plants, SEGS I (built in 1984) and SEGS II (built in 1985) of the SEGS network are located in Daggett. Daggett was also home to a unique solar thermal energy plant named Solar One, a pilot project which was operational from 1982 to 1986. The plant used mirror-like heliostats to aim sunlight at a collecting sphere located on a solar power tower (a type of solar furnace), through which oil flowed. The large quantity of sunlight reflected on the sphere superheated the oil, which was then used to create steam for power generation. The plant was upgraded in 1995 as part of the Solar Two project. Solar Two substituted molten salt compounds instead of oil as an energy storage medium. Solar Two was decommissioned in 1999, and the facility was converted in 2001 into a gamma-ray astronomy telescope. The facility is now known as CACTUS (Converted Atmospheric Cherenkov Telescope Using Solar-2). CACTUS, which is operated by the University of California, Davis but owned by Southern California Edison, operated from late 2004 until late 2005. Daggett is a station on the BNSF Railway on the Needles Subdivision. Trains are frequent on the line as this line goes to Chicago, it is also a junction of the Union Pacific's Cima subdivision, the former LA&SL, line from Salt Lake City, Utah via Las Vegas, Nevada. The UP runs via trackage rights on the BNSF and goes to Riverside, California. Back in its heyday, Daggett had two narrow gauge railroads, the Borate and Daggett Railroad and the Waterloo Mining Railroad, both built to export silver and borax ore out of the Calico Mountains several miles north. Both were 3 ft gauge, and both were serviced by two steam locomotives each. But after 1907, both of these railroads were closed down and abandoned due to the mining companies moving on to greener pastures found to the north in Death Valley. The old railroad beds can still be traced in some places in the desert, but now most of the old grades have been paved over to support cars and off-road vehicles. The Daggett Cemetery, which features graves dating back to the early 1900s, is located at 34°51′31″N 116°52′48″W﻿ / ﻿34.85861°N 116.88000°W﻿ / 34.85861; -116.88000. Daggett appears in The Cardigans' video for "Favorite Game." The 1940 movie The Grapes of Wrath used the Daggett as a filming location. According to the Köppen Climate Classification system, Daggett has a semi-arid climate, abbreviated "BSk" on climate maps. ^ "SUNRAY/SEGS". Cogentrix Energy Power Management. Archived from the original on May 16, 2013. ^ a b "History of Solar Two". Archived from the original on August 10, 2009. ^ "Solar Two Experimental Solar Facility". Retrieved May 29, 2009. ^ Cejnar, Jessica (November 24, 2009). "Going out with a bang: Edison demolishes Daggett solar tower". Desert Dispatch. Archived from the original on February 18, 2012. Retrieved January 6, 2012.